Tanker trucks are specially designed to safely transport condensed gases, liquid loads or dry bulk cargo across the roadways of the nation. Kan-Haul specializes in bulk liquid food transportation, which makes tanker trucks our specialty. Tankers are best distinguished by their unusual shape. Tankers are comprised of a cylindrically-shaped tank lying horizontally upon the vehicle’s body. Less common characteristics include the tank’s compliance with human food regulation standards, refrigeration capabilities, acid resistance and pressurization capabilities. The largest vehicles in the tanker family are those that are similar to railroad tank cars; these are designed specifically for liquid loads. There is a wide variety of tanker trucks available, each adapted to the different types of loads the vehicle transports. These vehicles are challenging to drive due to the high center of gravity. Tank trucks are constructed from aluminum, carbon steel, stainless steel, or fiberglass-reinforced plastic, depending on the product being transported by the truck. Large tank trucks, typically ranging in capacity from 5,500 to 11,600 United States gallons (or 20,800 to 43,900L; 4,580 to 9,660 imperial gallons), are the vehicles most commonly used to transport gasoline to gas stations. Other uses of tankers include the transportation of liquids such as concrete, water, milk and industrial chemicals. Some tankers have up to six compartments inside the tank to allow for the delivery of multiple products at the same time. This is particularly convenient when a truck is carrying different grades of gas to a gas station simultaneously. Small tankers, having a capacity of no more than 3,000 United States gallons (11,000 Liters; 2,500 imperial gallons), are used for transporting light liquid cargos across small areas. An example frequently seen throughout the nation is the septic service truck used to vacuum-clean multiple septic tanks and transport the waste to a collection site. Another common use of these small tankers is transporting liquefied petroleum gas to residential households. There is approximately 1,000 United States gallons (3,800 Liters; 830 imperial gallons) of the liquefied, pressurized gas stored in these trucks. Food grade tanker trucks are specifically designed to transport liquid food. The most common food item carried by tanker trucks is milk, but there are a variety of other products that fill these hollow metal tubes. “Tamper Evident Seals” must be one-use only, non-resalable, virtually impossible to tamper with, easy to identify and must be constructed of non-toxic, non-corrosive, cinchable material. Cleaners of food grade tankers must food grade themselves and have been third-party confirmed as to meeting its advertised performance. More about the sanitation guidelines can be found here. Contact us for liquid food transport today! Tanker trucks are a critical part of our food delivery system, allowing for quick, safe delivery of perishable goods to stores across the country. 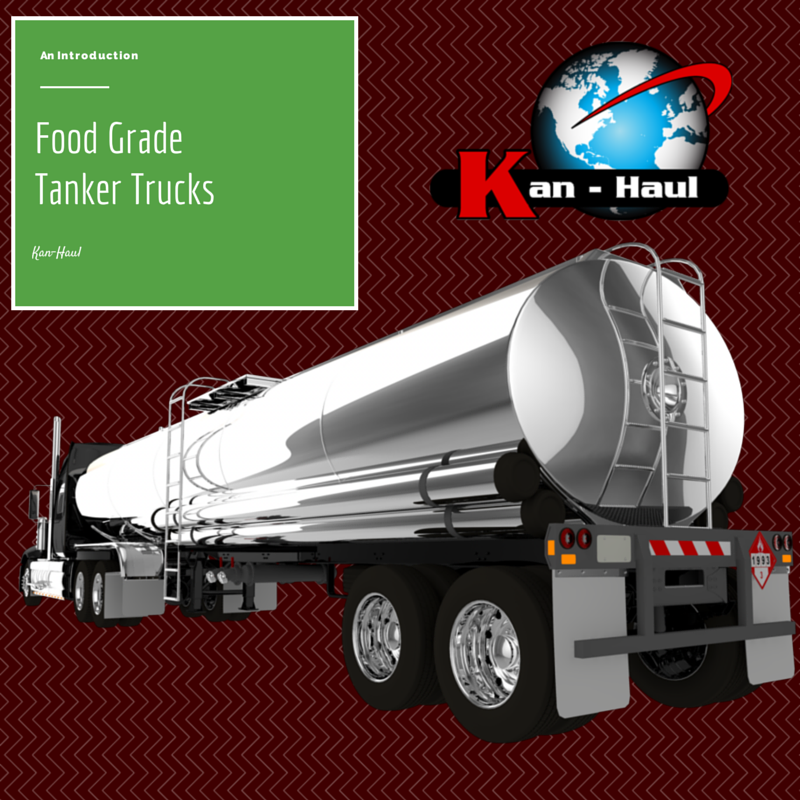 If you need reliable bulk liquid food transportation, call Kan-Haul at (800) 959-9501 or fill out our online form. I found An Intro To Food Grade Tanker Trucks lesson very useful. I have a question for you: I am working for an agency which transports dangerous liquid goods in Tanker Trucks. Our tanker trucks are not Food Grade. However, there is very little job for us, because chemical industry is not working. So, I am wondering, how could we use our tanker trucks for liquid food transport (particularly vine)? I have an idea: is there on the market, something like a “condom” for tank, like a huge plastic bag, which could be placed in our tank, then filled with vine, and it would protect the load from any contact with the tank wall? Of course, after one use, this plastic bag would be replaced with a new one. I hope that you could give me an answer! You may write on my email.